Our research on background free imaging through selective magnetic modulation of nanodiamond fluorescence was showcased on the cover of the April edition of Biomedical Optics Express. Currently, in vivo fluorescence-based imaging is hindered by background noise, especially because of autofluorescence that naturally occurs in tissue. Existing optical imaging methods thus have limitations in visualizing deep into tissue or with low concentrations of imaging probes. Fluorescent nanodiamonds (FNDs) are biocompatible nanoparticles which have great potential both as probes and drug delivery agents. A wide-field magnetic modulation imaging system to eliminate background noise in FND emissions was developed. Its effectiveness was demonstrated with two methods by imaging FNDs overpowered by "background" dye under a microscope and in sentinel lymph nodes in mice. The first simply subtracts images with or without a magnetic field and further averages the subtracted images. This method could be implemented to create a running average image updated in real time. The second method, which relies on phase sensitive lock-in detection, can be implemented for smaller magnetic fields and faster modulation rates. The closest lymph nodes to the tumor, sentinel nodes, are often a crucial indicator of the stage of cancer in the body. Using fluorescence imaging to detect sentinel lymph nodes is highly desired, but the technique suffers from background noise. After injecting FNDs into the foot pads of mice, images were taken to identify particles that drained to sentinel lymph nodes. Through magnetic modulation methods, lymph nodes were identified that were otherwise not visible with the conventional techniques of spectral unmixing. Magnetic modulation fluorescence imaging with nanodiamonds has demonstrated the potential to promote a more proactive and accurate diagnosis and prognosis of cancers. Eliminating background noise is crucial to improving the efficacy and versatility of fluorescence imaging. 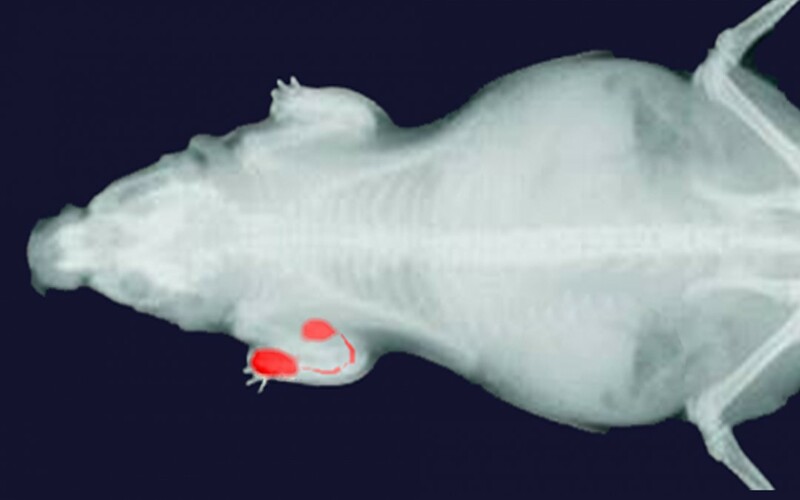 By substantially increasing background rejection, the technique above not only improves existing FND based measurements but also has the potential to increase the tissue depth through which FNDs can be used in vivo, thus opening up new opportunities for this type of imaging.